New Year’s resolutions – we’ve all made them, but how often we’ve stuck with them is another story. Whether it’s losing something (those extra ten pounds), gaining something (a better job) or quitting something (nobody likes a quitter they say, except when it comes to something like cigarettes), there’s a number of things that may top ones resolution list. 1. Visit a Sno-Park: This winter may be off to a slower start than expected for area ski resorts, the Sno-Parks provide activity with or without snow. Whether it’s hiking around and enjoying the views (all year round, even without snow! ), strapping on snowshoes or cross country skis and exploring the trails, or bringing a sled to navigate the hills, Sno-Parks offer fun (and exercise!) for the entire family. Check out Salt Creek Sno-Park just 21 miles east of Oakridge. 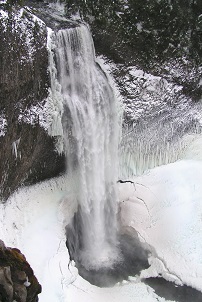 Here you will find trails leading to Oregon’s second highest waterfall, Salt Creek Falls, as well as Fuji Shelter, a three-sided structure with a wood stove, perfect for taking a break from a day of exploring. 2. Run the Winter Predictor: Have you ever participated in a race where you try and see how accurate you can be when it comes to guessing your finish time? The Winter Predictor is just that – a running/walking event where participants predict their finish time in advance. Watches and other devices to keep time are a definite no-no, as awards are given out based on who finishes closest to their predicted time. Choose from a 6K, 13K, or 20K course on Saturday, January 18 starting at Skinner Butte Park and finishing at the Lamb Cottage. 3. Take the Polar Plunge: While participating in this event may not involve a lot of swimming, it’s sure to get your heart rate up (all while contributing to a great cause). 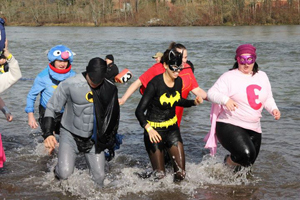 On February 8 at Maurie Jacobs Park, join other “plungers” as you venture into the chilly Willamette River to raise money for Special Olympics Oregon. 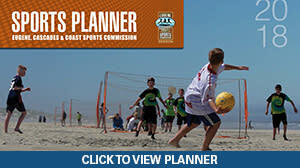 Sign up with your own team to collect pledges, or check the Polar Plunge Oregon website, as some teams are accepting new members from the public. Costumes are encouraged, so start planning ahead! All participants must raise at least $50 for the honor of taking the icy plunge, and get a well-deserved long sleeve shirt, a bowl of soup, and of course, bragging rights. 4. 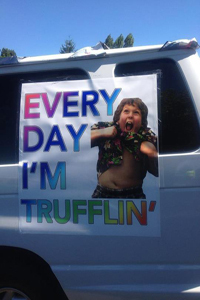 Do the Truffle Shuffle: Chocolate may often be one of the most motivating factors as to why people run, but chocolate is actually used as incentive to finish one local race. The 33rd Annual Truffle Shuffle at Alton Baker Park rewards all finishers with a chocolate truffle (random prize drawings are also held on race day). Sign up for a kids 700m Fun Run or a 2 mile run, 2 mile walk, or 4 mile run to benefit Committed Partners for Youth on Sunday, February 9. 5. Go ice skating: Get in the winter spirit by heading over to The Rink Exchange and trying your hand (or feet) at ice skating. With a number of public skate sessions available throughout the week (and the possibility of burning up to 500 calories an hour! ), ice skating is a great way to get moving, and is best done with friends (you even get a discount on admission if you bring enough people). Classes are also available for those wanting to learn the basic skills of skating or ice hockey.